Spend all week face-down in a toy coma? Don't worry, we've got the best of the week recapped right here. Check out the toys you missed, DC's big announcements and the sluttiest video-game outfits we've ever seen! This is it - the fluffy flying bison we've been waiting for! How is M. Night Shyamalan going to bring the giant six-legged beast named Appa to life? Like this. 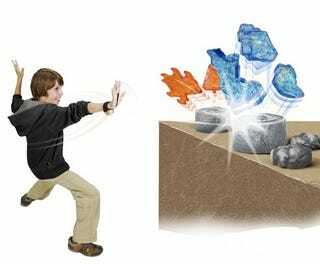 Check out the whole line of new Airbender movie toys. Can DC Comics be #1 in the market again? Is Blackest Night key to the publisher's future? We asked new DC co-publishers Dan Didio and Jim Lee, as well as new DC Entertainment Chief Creative Officer Geoff Johns. Is It Too Late To Save The Imperial Commandos? Fans have launched a petition to get Karen Traviss to return and finish her masterful series of Star Wars novels featuring the Imperial Commandos. But she tells io9 it's too late, and explains what happened to her Boba Fett novel. What's it like when X-Men get between the sheets? Sure, you're perpetually surrounded by statuesque mutants in skintight pleather, but chances are your attempts at amorousness will be illegal in several states and freak out your readership. You Want To Reboot Terminator? Here's How! Now that hedge-fund Pacificor has spent $29.5 million for the Terminator movie rights, a new chapter in the war against Skynet seems assured. We're betting it'll be a reboot - and here's how it could be a decent movie. You Want To Reboot Terminator? Here&apos;s How! If you're in the San Antonio, Texas area, you've got a chance to catch some lectures from a gang of futurists, critics, and science fiction writers during this spring's Reality Hackers series at Trinity University. Three decades ago, William Gibson's Neuromancer showed us a future where people "jack into" computers by plugging wires into their brains. Today a new study shows that our brains may be perfectly adapted for Gibson's world. Halo Legends mixes anime with Bungie's hugely-successful SF war video game franchise, and the result is curiously less than the sum of its parts. The animation is great, the backstory interesting... So why doesn't it work? We're eagerly waiting to find out more about the Lucian Alliance on Stargate Universe, since they were the bandits that forced the Destiny crew to flee in the first place. And new casting pages reveal a villain and a rebel. Fighting game Tekken has released a batch of new movie stills from the live-action movie adaptation. And while we're still waiting for the cheetah-headed King character, we're shocked that actors are actually showing more skin than in the video game. io9 was at Hasbro's Toy Fair showroom yesterday, getting an exclusive first look at the toymaker's upcoming Star Wars, G.I. Joe, Marvel, and Transformers lines. And no, the life-size Bumblebee in the lobby sadly won't be hitting shelves anytime soon.